Once a week while brushing, be sure to look for irregularities of the skin. Brushing is also a positive way to interact with your cat. If you notice irregularities or have questions we would encourage you to schedule a veterinary appointment. Of course, if dermatological conditions arise, then bathing with a prescribed cleanser may be recommended. Trimming your cat’s claws can be challenging. One of the best and safest ways to trim your cat’s nails is to be informed before you begin. Perhaps watching a video will teach you how to hold your cat comfortably while showing you step by step how to get the job done quickly, without causing stress to your cat. Specialized cat nail clippers can be used, however it is extremely important to understand that most of what looks like the cat’s nail actually contains the cat’s “quick” which delivers blood supply to the nail. As the cat’s nail gets longer, so does the quick. This is why trimming longer cat nails typically results in the nail bleeding. However, as the tip of the nail is trimmed, the quick will recede. Therefore, proper trimming of cat’s nails involves trimming the very tip of the nail and then waiting a few days for the quick to recede, then trimming the very tip of the nail again. This can be repeated several times on longer nails until the quick recedes enough that you are able to trim the nail to the proper length. However, even once you understand the procedure for trimming your cat’s nails little by little, the trickiest part may be simply handling the cat in a way that you will be able to trim the nail without causing undue trauma to the cat and potentially earning yourself some cat scratches along the way. When in doubt, cat claw trimming is a task that is best left to professionals. Most veterinarians typically do not recommend cutting your cat’s fur. For some long-haired breeds whose fur becomes matted or hopelessly tangled, those tangles may need to be cut out. Also there are a few styles such as the “lion’s cut” which have become popular among owners of long haired cats. However, these cuts require trimmers that can make cats very uneasy, startled and unnecessarily traumatized. These are services that are best left in the hands of professionals. Cats who have long hair need to be combed more often than short-haired cats. Try to comb your cat’s fur at least a couple times per week. Keep your cat’s nails trimmed for their comfort and to protect yourself from being scratched. It’s best to leave nail clipping to a professional. 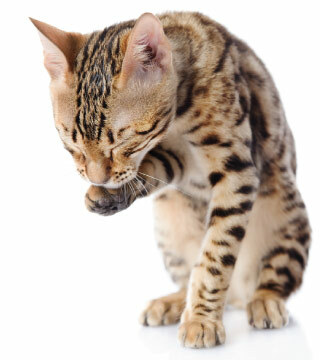 If you notice your cat itching, biting or developing skin conditions such as bumps, rashes, fur loss, scaly dry skin or any other dermatological condition, make a veterinary appointment right away. Or, if your cat is not keeping up with his grooming, or you notice anything unusual with his skin, make a veterinary appointment today.